Home » Featured » Should we Adam and Eve it? Adam and Eve, the first humans, the basis of the human race, the cornerstones of a Biblical understanding of God’s creation – or are they? Is there more than one way of thinking of Adam and Eve, and does it actually matter whether they existed or not? One thing is sure, there is no universal agreement on this topic. Many Christians believe in Adam and Eve as the literal first humans, created by God as Homo Sapiens, who lived in a literal Garden of Eden. Others though are less convinced by the idea that there is a specific intention to give an ‘historic’ account in Genesis. Famously CS Lewis spoke of parts of the Genesis story as ‘fabulous’ – by which he meant ‘like a fable’ rather than ‘wonderful’. Then there’s the question of whether there is a divide between faith and science – it’s certainly difficult to believe in a literal Adam and Eve, and accept the theory of evolution. On that basis some think there must be a way of understanding Adam and Eve in the light of the evolutionary process. So what are the options for understanding Adam and Eve? 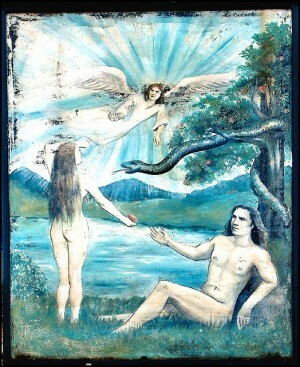 According to a literal approach, Adam and Eve really existed, made out of earth by God in his own ‘likeness’. This understanding effectively denies the legitimacy of the evolutionary theory, and leaves people who believe in early forms of pre-humans (like Neanderthals) with a bit of explaining to do. It does however seem to fit well with a traditional understanding of original sin, and thus the need for redemption through Christ’s death on the cross. This way of looking at the story accepts the idea of Adam and Eve as literal individual people, or at least as representative individuals – but suggests that God created them via the process of evolution, making them deliberately by means of intelligent design. On these lines then, Adam and Eve are the ‘missing link’ the point at which the pre-human species turned into the first humans. While maintaining an acceptance that God created humanity, this approach takes the route of saying that the account of Creation in Genesis is actually to be read as a parable rather than a ‘history’ account. It is a way of explaining what happened, using language which was understood at the time of writing, and conveniently explains why we have two different takes on the same story in the first two chapters of Genesis. This approach has the creation account as a work of theology – setting out the place of Israel in God’s world. According to this way of thinking Adam is a way of understanding the failure of Israel to reach its potential, not a way of telling the story of the beginning of the world. But does it matter whether we accept any one of these accounts rather the other? Over the centuries, believers of different stripes have taken different approaches to the question of who Adam and Eve were – and built or reconfigured their theology accordingly. Where do you stand on this? Let us know in the comments…. If one takes the literal approach then how do we explain the existence of those people whom Cain feared would kill him on sight for having murdered his brother - there were only Adam, Eve, Cain and Abel? No, Adam and Eve represent the first humans, and the story of the Fall tries to explain (as do similar stories in other cultures) why people do bad things and Genesis 1 2 seek not to explain how God created but only that God DID create, that Creation is good and that humans have a unique role to play. The Creator has established the laws of Nature and works through them. Can God interrupt? Of course, but such events are rare, Rather, God guides rather than instructs. There is no contradiction between believing in evolution and also that the Universe was created by God. I THINK THE STORY OF CAIN AND ABLE REFERS TO HOMO SAPIEN WIPEING OUT NEANDERTHAL CREATION. David - the explanation given would usually be that Adam and Eve had had more children as well by that time, and thus it would have been Cain's brothers, sisters and their descendants who he feared. I take your point about Genesis 1-2 being less about 'how' and more to emphasis God as Creator. But too often such a view is offered up without the added work of explaining what the various details in the story are actually getting at if they are not historical details. Also, on a more pedantic note, I would say that 'historical' is a better word than 'literal' when considering whether Adam and Eve actually existed - although this would cover both of the first two positions in a sense, rather than just the first. The book by C John Collins on this topic recently is probably useful, as is the collections of essays 'Should Christian Embrace Evolution?' edited by Norman C. Nevin on one side and 'Creation & Evolution: Do We Have to Choose?' on the other. GOD may not give us all the details, but GOD does not lie, HIS account of Adam and Eve is both literal and historical, HIS word is truth. We are not to go beyond what is written, nor take away, nor add on in our feeble understanding. 1) Literal - no question. This is based on the evidence of scripture, including the words of Jesus, including Romans 5, etc. Common ancestry is an intrinsic part of the story of original sin, familial descent, one salvation for all, etc. To find any other interpretation requires reinterpreting the Bible in ways that clearly don't fit with the common sense reading. I believe it because Jesus did. Hi Jonathan, would you say that Jesus believed the earth was flat? The apostles would have done, and its most likely that as a man, he would have done too - its something people wouldn't even have questioned at the time..?